Hand-bottled in limited quantity for a superior taste and smoothness. Deep in Kentucky, tiny Knob Creek spills and riffles down through the hills. 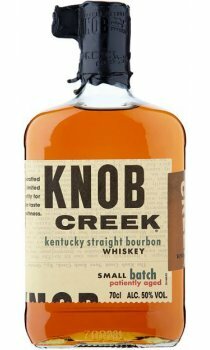 Like the bourbon bearing its name, there's not much of Knob Creek but what there is rewards your finding it. Named after Abraham Lincoln's boyhood home in Kentucky, Knob Creek is truly bourbon at its finest. Created to represent whiskey before it was mass produced, Knob Creek embodies the look, feel and taste of pre-prohibition bourbon. This full-bodied, flavourful bourbon takes classic cocktails to a new level. Knob Creek Bourbon, bottled at an honest 100 proof (50% abv) like all good bourbons were a century ago, is aged nine years in charred American white oak which lends this bourbon its maple sugar aroma, distinctive sweetness and rich, full-bodied flavour, giving it the distinction of being aged the longest of the small-batch bourbons. This extra aging allows it to absorb more of the sugar in the wood, giving it a slightly sweeter taste and nose. This is a whiskey that it should be made a crime to mix it. It should be sipped straight with no ice to appreciate to beautifully crafted flavour. Great value for the price. Would recommend to any whiskey lover. A definite must for the drinks cabinet at Xmas. This is truly a great example of traditional bourbon whiskey. I had the pleasure of drinking this last summer with friends and it is now a firm favourite in my drinks cabinet. Having first heard of knob creek on a Jim beam documentary, the only bonus on a Lynyrd Skynyrd DVD, I sought out to taste the joys. and I must say, a symphony of sweet caramel just explodes with every sip, absolutely fantastic. This is a true Kentucky Straight Bourbon! A very fine sip'n whiskey that is as equally good straight up on the rocks or mixed with Coca-Cola. Personally I am a purest when it comes to Knob Creek, straight up on the rocks for me please. Did I also mention the velvety smooth, with a hint of slightly sweet spiced flavour and just enough of a bite to endear you to its humble yet bold Kentucky attitude? Yum! A fantastic real bourbon with a great full flavour. A small batch produced by uncle Jim.